The quirky administrative capital of Bolivia, La Paz is a chaotic city happily stuck in an unimaginable time-warp. Unimaginable, because as the rest of the continent takes colossal bounds forward in search of modernity, this place seems in no hurry to follow suit. Although ‘hurry’ is not something you’d want to be doing either, if you lived here. La Paz is the world’s highest capital and a city that assaults the senses like nothing else. Between the frenzied traffic and legendary markets, the surprisingly excellent food and the delightfully traditional locals, La Paz is undoubtedly one of the most distinctive cities in the world. The spectacular setting of La Paz is probably its most precious asset. Were this city plonked amidst an uninspiring landscape, you’d be tempted to make yours a very fleeting visit. But as maddening as the city is – and trust us, it is – you’ll be forced to soak it up at a leisurely pace. This is one of those ‘breathtaking’ travel destinations that really takes the adjective to heart. Sitting at an eye-popping altitude of over 4,000m, the undisputed ‘people’s capital’ is precariously perched atop and all along the vertiginous sides of a river-carved plateau on the edge of the astounding Bolivian Altiplano. The altitude means your lungs will scream for oxygen at every step, and stopping for a headache-relieving cup of coca tea becomes an hourly habit. But that’s ok. 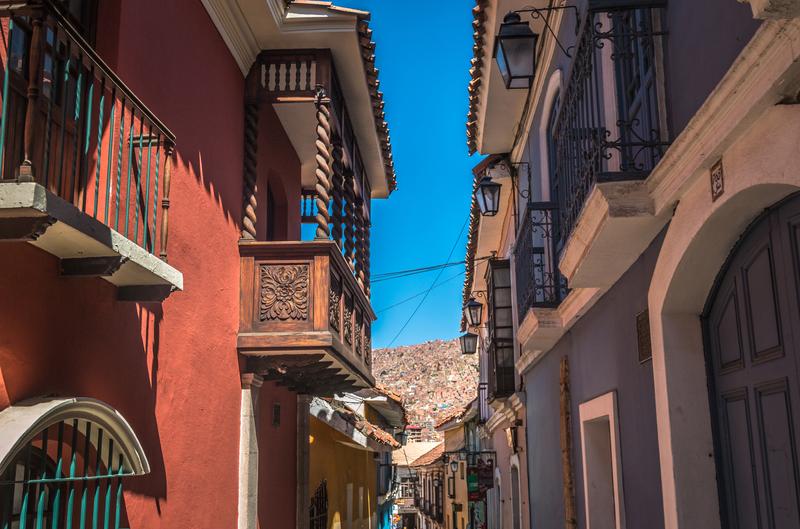 The only thing you need to really enjoy and discover La Paz is time. Everything else can wait. The city’s layout closely resembles a bowl, with the most affluent inhabitants taking up the comfortable (and warmer) centre and the poorest living along the side and top of the canyon. 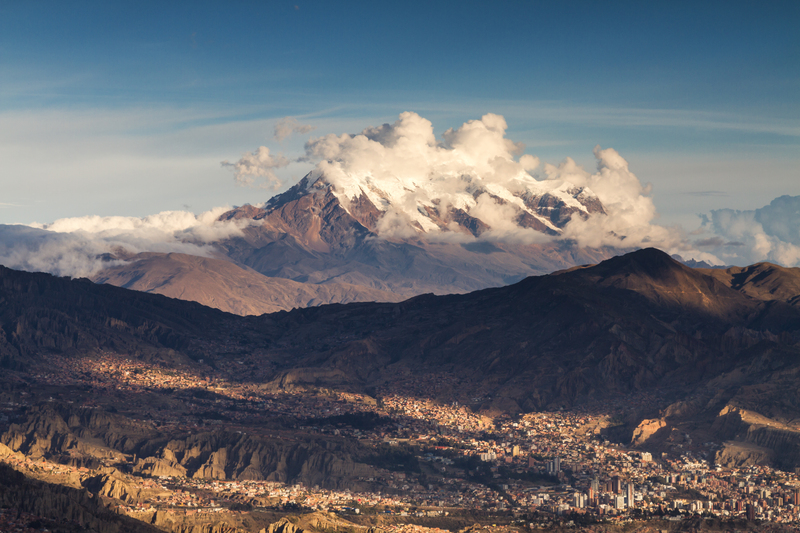 In La Paz, the higher you live, the poorer you are, views notwithstanding. Visitors tend to use taxis a lot in La Paz – rather unsurprisingly – as walking extensively at this altitude is seriously hard work. Centro – Sagarnaga Street is the epicentre of tourist activity downtown, which is actually half-way up the city. Here, you’ll find the iconic cobblestone streets which are so characteristic of the colonial city centre, as well as all the major tourist attractions like the Witches’ Markets, the main plaza (Murillo), the beautiful Church of St Francis, a few very good museums and the crumbling remnants of the what were once stunning colonial buildings. This area is awash with a wide selection of accommodation, dining and drinking options, and is a buzzy place to be both during the day and of an evening. This is the best area for souvenir shopping or if you’ve lost all your left socks during the last laundry stint in Bolivia. Zona Sur – The affluent hub of La Paz is a contrasting world away from Centro and the place where you’ll find the best hotels and restaurants. High-end shopping and trendy bars line the modern streets of this area, which is favoured by foreign expats and the local elite alike. This is a wonderful place to see how ‘the other half lives’ and being 500m lower in altitude you can actually experience a different climate. El Alto – Way up above the lucky ones sits the most congested shanty town you’ll probably ever visit. Continuously growing on the rim of the canyon in which La Paz is built – and adjacent to the city’s main airport – El Alto couldn’t be more contrasting. The endless sprawl of unattractiveness here is compensated by the most glorious views imaginable. The view from El Alto down to the sprawling greyish mess that is the bulk of the city is incredibly mesmerising. Most of all at sunset, when the imposing snow-capped peaks of Illimani glow a fiery red, just to remind you that you are, in fact, standing on the roof of South America. 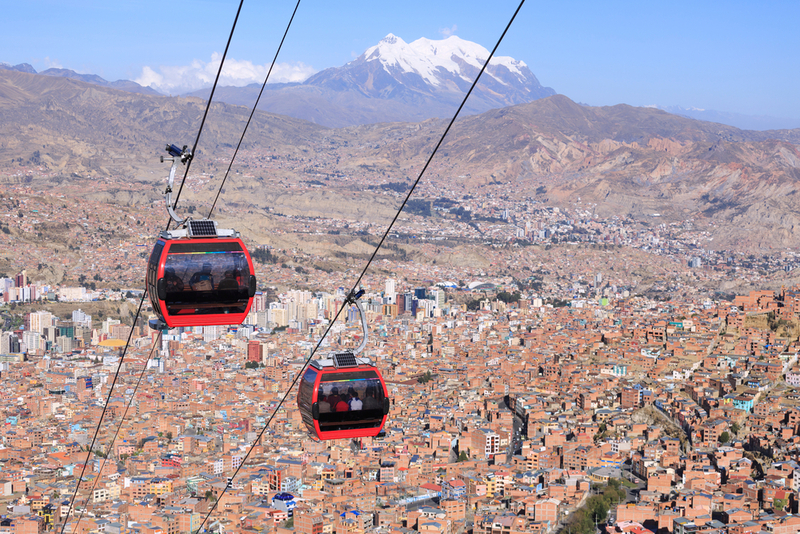 A cable car connects El Alto to downtown and a visit here is certainly recommended – not least for the chance to hover over one of the world’s most congested cemeteries – for those with tough skin, a warm jacket and a healthy smattering of Spanish. Or for anyone who simply can’t face a hike up to the Kili Kili lookout point for exceptional views. Sopocachi – The young and trendy area of La Paz is just a short taxi ride away from Centro and offers a lovely compromise between its bustling streets and the infinitely gentrified ones of Zona Sur. With its vibrant nightlife and increasing array of cool shops, bars and café, Sopocachi is a social hub and a fun place to spend a whole day. 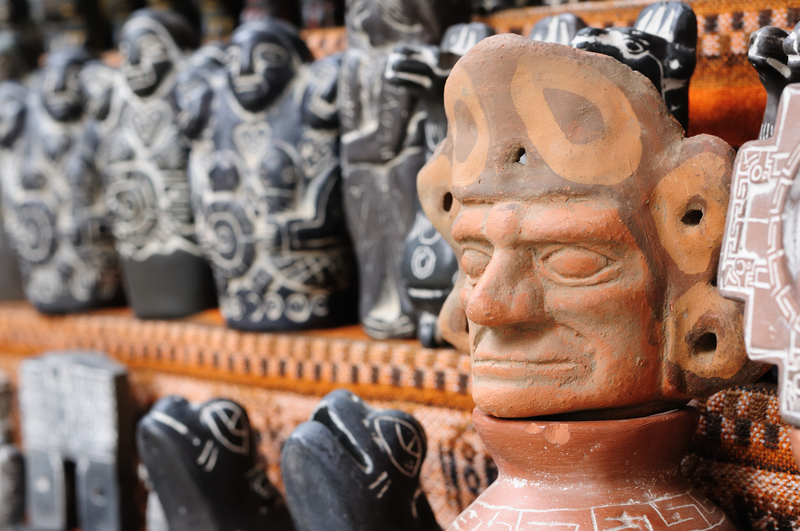 Yet be that as it may, there’s certainly an established list of ‘must see and do’ in la Paz. Sagarnaga Street – Souvenir stalls galore, food and cafés aplenty (and just about every tourist that comes to town) congregate on this long stretch of road, which starts south of Plaza San Francisco. Plaza San Francisco – The city’s main plaza, home of its eponymous 18th-century church, is wonderful to visit both during the day and at night. The cathedral is stupendous and considered one of the best examples of colonial-era architecture in the Americas. You can also climb up to the top of the church tower for excellent views and let the street performers and food stalls hold you here for just a little longer. The Witches’’ Market – At first, this market of macabre trinkets seems like an overly-exaggerated attraction made only for tourists. But then you see Aymara locals bartering over love potions and dried-up wrinkly frogs and llama foetuses, and that’s when you realise you’ve just entered another world. Fascinating is the best way to describe this place. You’ll find the Mercado de las Brujas just one block back from Sagarnaga, on Calle Linares. Jaen Street – Calle Jaen is a pedestrianised strip in the heart of the city which boasts an eclectic and colourful mix of architectural treasures and an ever-present buzz. You’ll find quite a few interesting museums down here too. Teleferico – Just a few Bolivians is all that it will cost you to ascend to the top of the city and soak up the waves of red tiled roofs below. Make sure you pick a sunny day for the trip and take a stroll along Avenida Panorama to the left of the top station. Death Road – Cycling at a gravity-assisted speed down the infamous Death Road of Bolivia is one of the most famous adrenalin-packed activities in the whole continent. This terrifyingly unforgettable experience is either a must or a must-not, depending on your survival instincts. La Paz offers some outstanding options for one or multiple-day trips, with visits to Death Valley (Valle de la Luna), Lake Titicaca, the Amazonian haven of Rurrenabaque, the archaeological site of Tiwanaku, as well as serious hiking in the Cordillera Real, all being very popular options. For this and other logistical reasons, the city is a very convenient base from where to explore the rest of Bolivia, so if you don’t manage to see and do everything you can chill right out. There’s always a next time with La Paz. 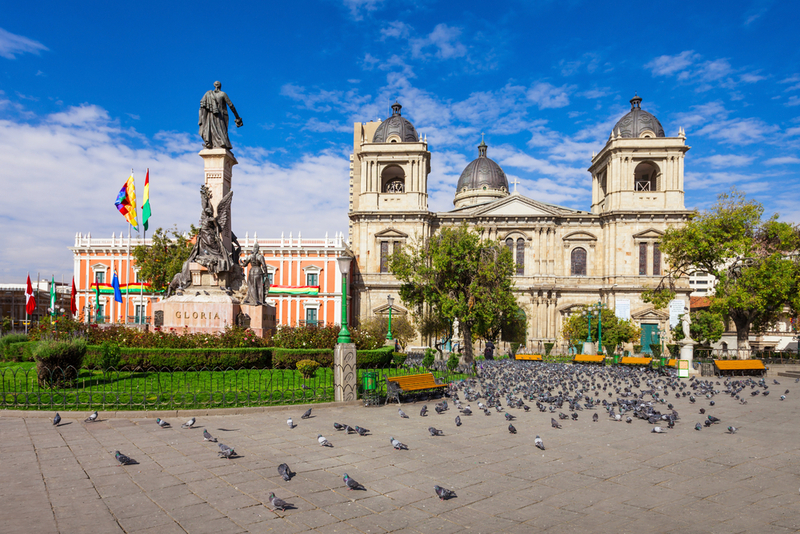 It’s highly unlikely that La Paz per se is your only destination in Bolivia, so we’ll give you a rundown on the best time to visit the whole country, in general. Dry season runs between the months of May and October, and this is by far the best time of year to visit, when the skies over Bolivia are a resplendent blue and heavy rains blissfully absent. Travelling during dry season is almost essential in Bolivia, because heavy rains can disrupt travel overland and completely block crossings of the mighty Uyuni Salt Flats and trips to Rurrenabaque. Being at such high overall altitude means that nights in La Paz are always cold, although daytime temps can soar on sunny days. The most popular direct flights into La Paz originate from Lima, in Peru, and Santiago, in Chile. Given the city’s excellent location, however, many visitors choose to reach the city overland which is also a brilliant option for those worried about the altitude. When coming overland you’ll undoubtedly be climbing up here over a few days, which will give you a much better chance at acclimatisation. For being such a small and unassuming country, Bolivia – and La Paz – have an insane amount of pull. In fact, this country is home to some of the most revered highlights in all of South America. 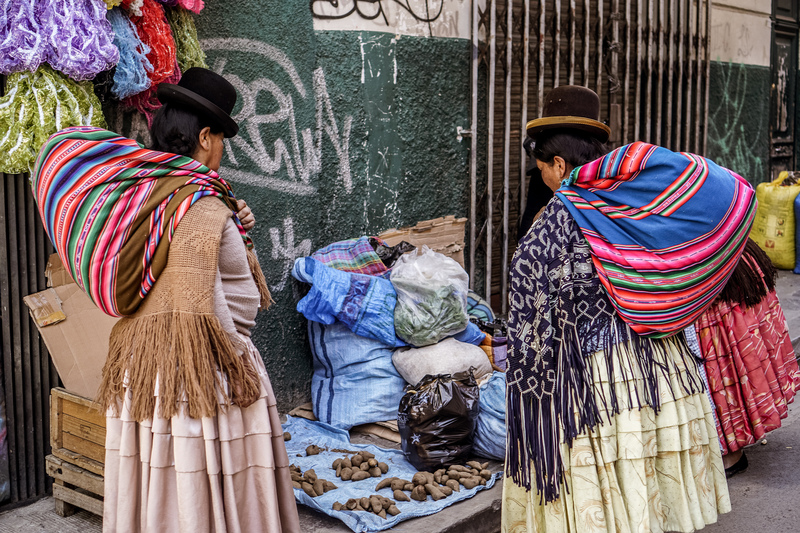 Check out our Bolivia tours page if you want to get a glimpse of all the magical experiences you can tackle while here, and don’t forget to scroll to the bottom of the page for more insights into this fascinating country and culture.